Lately I've been enjoying gluten free granola for breakfast. But yesterday I went to the cupboard and realized I was all out. I had gluten free oats in the pantry, so I decided to make my own. You can add or omit anything to this recipe, these are just the things I had on hand, and I think it turned out really good! We make our own granola also -- It makes a bunch and we freeze the extra so it's always fresh. Your recipe sounds very good - I don't know too much about gluten free -- have you thought about coconut oil? 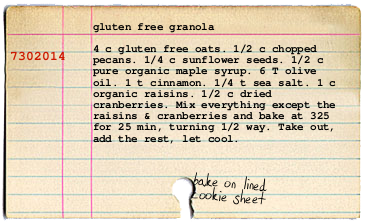 It is very good for you and it imparts a really good flavor to the granola. As usually: anyway you have to go to the shop as most probably you lack at least one ingredient and if you go to a shop you will simply buy granola there. I'll better go and look for an economics homework help. I just love this gaming site , this is called the cool math game junction cool maths games and you will never disappointed with app as it has so many math games which are one of the finest math game of its kind and thats why this game is raising popular among all the age groups so you should also give it a try .